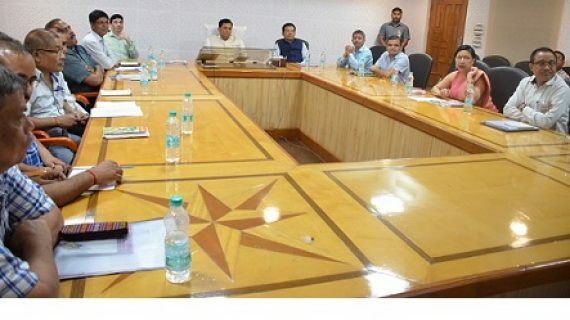 Assam Chief Minister Sarbananda Sonowal reviewing the implementation of programmes and schemes of Panchayat & Rural Development Department at Janata Bhawan on May 21, 2018. Assam government would soon release pension to 16 lakh senior citizens of the State. Assam Chief Minister Sarbananda Sonowal, while reviewing the implementation of the programmes and schemes of the Panchayat & Rural Development Department in a meeting held at Janata Bhawan on Monday, directed the P&RD officials to expedite the pension process in a bid to empower the senior citizens. Under the new initiative, the State government would provide pension to all senior citizens who are 60 years and above irrespective of APL or BPL category. The pensioners would get Rs 250 per month as pension and this will be transferred through online. Moreover, to weed out any discrepancy in the list of pensioners, the preliminary list of selected beneficiaries would be displayed in the Gaon Panchayat offices and would be discussed in the gaon sabhas. Further, names of beneficiaries for entry in the list would be reopened in every six months. During the meeting, the Chief Minister also reviewed the implementation of Kanaklata Mahila Sabalikaran Yojana. The departmental officials informed the Chief Minister that fund under the scheme would soon be released online. Minister of State (Independent Charge) for Panchayat & Rural Development Naba Kumar Doley, Media Advisor to the Chief Minister Hrishikesh Goswami, Legal Advisor to the Chief Minister Santanu Bharali, Additional Chief Secretary MGVK Bhanu, Principal Secretary to the Chief Minister Sanjay Lohiya and several other senior officials were also present in the meeting.